Everyone has stuff, problems, challenges, tragedies. No one is immune. What I have learned, though, is how you deal with it defines who you are. You either curl up into a ball or you learn how to soldier through it. Will it be a battle scar or a badge of honor? My parents were raised during and just after the Depression. The philosophy of hard work and sweat equity loomed large. Nothing was bought unless you could pay for it with cash. My mother was a stay-at-home mom and my father worked incredibly hard as a Pan Am pilot to provide for us. Shortly after my fourteenth birthday, my father was diagnosed with a rare liver cancer that was already at stage 4 by the time it was discovered. He died just three months later. My nineteen-year-old brother was overseas in the air force, leaving just Mom and me at home. I knew I was going to have to figure out how to depend on myself, no matter what. As you can imagine, it was devastating for all of us. In the aftermath of Dad’s death, I learned that my mother did not know how to write a check. She had never worked outside the home, and like many women of her generation, she had completely relied on her husband. I remember saying to myself, “I will never be like that.” I knew I was going to have to figure out how to depend on myself, no matter what. When I was a sophomore in high school my mom told me there was no money for college and I had to make a plan. As challenging as it was, it helped me become who I am today. I became fiercely independent, won a scholarship, and became the first person in my family to graduate from college. To this day, that is one of the most important accomplishments of my life. Fast-forward fifteen years. I landed in Raleigh, North Carolina, after working in five other television markets across the Southeast as a news anchor and reporter. At this point I had been married for six years and my husband was very anxious for us to start a family. I’ll be honest, I was not as anxious. I had finally gotten the evening anchor job at the NBC station and my husband traveled Monday through Friday. It was not the ideal setup for a family. But I saw all these other working mothers doing it and I thought surely I could do it, too. “I can have it all,” I would say to myself. Yeah, right. 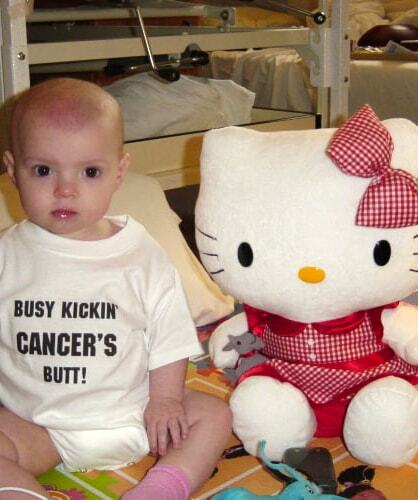 Just weeks later, Macie was diagnosed with leukemia. Acute myeloid leukemia, or AML as it’s commonly called. A blood cancer. It was absolutely the hardest thing our family could ever go through. We watched our six-month-old baby undergo twelve-hour infusions of chemotherapy for weeks on end, surgeries, spinal taps, countless transfusions, fevers, mouth sores, and pain. We didn’t know if Macie would even make it through the first round of treatment, since it was such a brutal protocol. But she did it with the most grace and bravery you could ever imagine. At the time, Macie was the youngest child to be diagnosed with AML at the North Carolina Children’s Hospital at UNC–Chapel Hill. The first round of treatment kept Macie quarantined in our hospital room for five weeks. We finally were discharged on Mother’s Day weekend 2005. It was such a blessing to be able to bring her home. Macie’s protocol called for seven more rounds of intense chemotherapy. So like everything else I did, I made a plan. Getting Macie well was my new job. We would do everything in our power to help her fight this disease. During round three of Macie’s protocol, she caught an infection, a common cold. But when you have no immune system, a simple bug can become life threatening. On August 5, 2005, Macie passed away. She was ten months old. Our lives stopped. The only way I can describe it is we functioned … but we were not living. I believe that if we didn’t have our son Conner, who was three at the time, we wouldn’t have gotten out of bed. Ever. We had to find a new way to live. After a lot of grief counseling, therapy, and constant support from our family and friends, we started to navigate our lives without Macie. Everything you hear about losing a child is true. You never “get over it.” You never “move on.” You must find an Option B.
I felt an incredible pull to make changes. Obviously, I was going to have to examine my priorities. I no longer felt like I could sit on the anchor desk at the TV station as if everything were going to go back to the way it was before. I had to dig deep, really deep to search for a new path. We knew we wanted to have more children. There was a terrible fear of something happening to Conner. We would never survive that. So we decided to try for another baby. Not to replace Macie, that would never happen. But we felt a strong pull to add to our little family. Problem was, I had my tubes tied because I thought we were done when Macie was born. She seemed healthy and I was so sure our family was complete. The orchestrator’s plan failed again. I was thirty-seven and I knew the clock was ticking. In 2006, we ended up at a fertility clinic. Our specialist advised me to undergo a tubal reversal surgery, try to conceive naturally, and if nothing worked, then move on to IVF. I believe it was a blessing and a sign from Macie that I was making the right decision to have the surgery. So I went into what was supposed to be a ninety-minute outpatient surgery to repair my tubes. Five hours later, I woke up to the surgeon standing over me asking why I hadn’t told him about my appendix. What? I didn’t know what he was talking about. Turns out, my appendix had burst. I immediately knew that I was supposed to be in that operating room, on that day, at that time, or I wouldn’t be here today. I believe it was a blessing and a sign from Macie that I was making the right decision to have the surgery. We eventually became pregnant, and in November 2007, our rainbow baby, Pierce, was born. A rainbow baby is a child born after a miscarriage, stillbirth, neonatal death, or infant loss. The term has encouraged parents to share their stories of loss—and the babies who followed. Our precious Pierce is the collective joy that pulls us out of darkness on a daily basis. My friend Becky Sansbury, author of After the Shock, explains the feeling of what it’s like to try to find joy after tremendous grief. It’s a sacred space. We would not have our beautiful Pierce had we not lost Macie. That stops me in my tracks. It’s a feeling, a knowing that pushes me beyond my normal way of thinking. I am so grateful for the short time we had with Macie. She taught us so much. She set the tone for how we put one foot in front of the other to keep going. No matter what. Finding the grit to get up and face each day with a positive light, instead of the darkness of grief, is what I must do each day to properly honor Macie’s courage. She really did teach us a lifetime of lessons in ten short months. In the years following Macie’s loss, I figured out a new way to live. It’s a work in progress. I try to be deliberate about being thankful for our blessings. My family, my friends, my work. It’s not that I don’t have bad days. I do. But the good outweighs the bad on most, and I have to remind myself of that often. In the years following Macie’s loss, I figured out a new way to live. It’s a work in progress. I don’t believe there’s a right or wrong way, just what works for you. And just when I thought I was figuring this out, I was diagnosed with advanced breast cancer in 2016. WTF! Seriously? Talk about a kick in the gut. With little time to waste, I began five months of chemotherapy followed by a double mastectomy, two months of radiation, and now a clinical trial. Yes, I was angry. Beyond angry. Hadn’t I given enough with Macie? Going down the “feeling sorry for myself” road was easy. However, I had to get off that path if I am going to beat this cancer. With my family and friends holding me up, both figuratively and literally, I made it through ten months of treatment. I’m most grateful for what Macie taught me while she endured her therapy, which was much harder than mine. Take one step at a time. Breathe. Look for the good in every situation, every obstacle, every roadblock. And finally, be grateful. Make it your mission to find something positive, even in the darkest places. Only then can you turn your battle scars into badges of honor. That&apos;s my Option B.